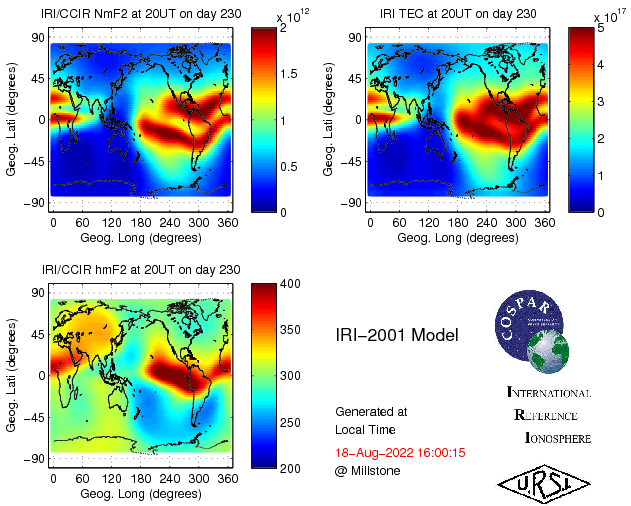 Plots shown here are NmF2, hmF2 and TEC based on the International Reference Ionosphere 2001 model for the current time, and are updated every hour. For more information about IRI, visit IRI's official webpage at http://modelweb.gsfc.nasa.gov/ionos/iri.html or contact Dr. Bilitza at GSFC, NASA. Visit http://madrigal.haystack.mit.edu/models/ for models based on incoherent scatter radars, as well as their realtime productions.